Today’s slice offering: snippets of New York. In front of me, two colleagues. To brunch, the bookstore, and aimless walking. Families out with strollers, knit hats, and gloves. A beautiful Sunday to be included in the food, the books, the talk; to have no schedule, nothing to do. No place to be. Washington Square Park performances, with amazed toddlers and adults. NYU sweatshirt purchased, with my daughter in mind. Public Theater lottery for Hamilton, with no luck. Dinner decisions, with the Empire State Building. Navigating back to our hotel, with warm drinks and bittersweet goodbyes, looking forward to the next time we meet. Good to be slicing with you all. Thank you, Two Writing Teachers for you support. 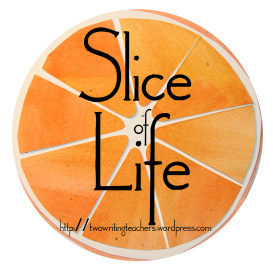 Read more slicer stories here. What a great description! You Rock! Safe travels home Monday! What a fun day for you! I followed along remembering Dayna’s post that I just read. Love that you had a day to explore and continue to experience the magic of NYC. You made me wish I was there, cold and all! Sounds like a wonderful weekend of learning, exploring, and enjoying. Such fun – hope you enjoyed every bit of the day. Until next time, Julieanne.